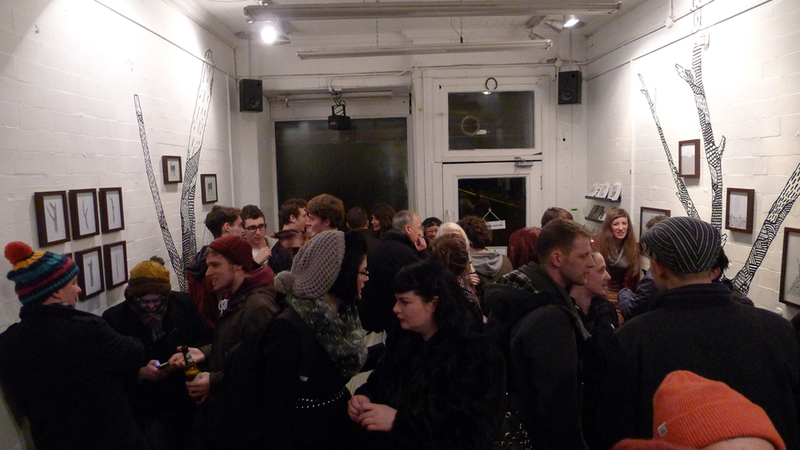 On 1st Feb we opened our first show of 2013, “Wee”, an exhibition from a member of Team Recoat, Scottish illustrator, David Galletly. David has exhibited in group and solo shows across the UK, internationally in cities like Philadelphia and Zurich aswell as at the Royal Academy of Arts in London. He has most recently been illustrating for Mary HK Choi's column in the US edition of WIRED magazine, creating graphic design at Fence Records, designing a limited edition Aberfeldy label for Dewars and creating an illustrated overview of Scotland for the social network, Kiltr. “Wee” is a collection of his distinctive, often humorous pen and ink drawings and he has created large beautiful drawings on the walls of the space. Galletly’s work toys with many mixed themes that are playful yet often have an underlying darkness. His drawings are pain-stakingly detailed with layers of pattern and texture created to confuse the eye as to the scale of the subject matter. This enjoyment in playing with size is the reason for the exhibition’s title.